the video game Rock Band anyway..."
and it's a musical kind of future at that... Good Times! New York, NY, April 1, 2009 – MTV Games and Harmonix’s Rock Band® are joining forces with Paramount Pictures and Spyglass Entertainment to celebrate the May 8th theatrical release of the film STAR TREK from director/producer J.J. Abrams. The first-of-its-kind collaboration will fuse together the massive cultural followings of both STAR TREK and the video game phenomenon Rock Band to engage fans with free music, an in-game battle of the bands, and futuristic avatar creation contest. Beginning today, fans can register for a 15-day sweepstakes that will give away 500 free Rock Band Music Store downloads each day from April 7th through April 21st for the Xbox LIVE Marketplace for Xbox 360® and PlayStation®Store for PlayStation3." "And if that’s not enough – fans will want to fire up Rock Band 2’s online Battle of the Bands mode to participate in the STAR TREK Ultimate Battle. Bands of three to four players can battle the Rock Band galaxy. The band with the highest score will win a STAR TREK hometown movie screening for their band and their friends. Additionally, twenty randomly selected players will win an awesome STAR TREK/Rock Band prize pack equipped with STAR TREK and Rock Band gear. The Battle of the Bands component will begin on April 20th and run through April 27th. The Rock Band and STAR TREK promotion will culminate when the first-ever avatar creation contest launches on April 27th. Fans will be asked to create a futuristic avatar in-game and export it to RockBand.com for the community and Harmonix team to judge the winner. The Duke of Gravity will ultimately decide which avatar has what it takes to rock with the Enterprise crew. The winner will be chosen on May 11th and win "The Future is Now" prize pack including the top of the line Rock Band game accessories. " both Star Trek fans and Rock fans... Cool! my "trekky-ness" anymore... Definitely Good Times! For more information on Rock Band and STAR TREK’s collaboration, visit www.ROCKBAND.com/StarTrek. From director/producer J.J. Abrams (“MISSION: IMPOSSIBLE III,” “Fringe,” “Lost” and “Alias”), producer Damon Lindelof and executive producers Bryan Burk and Jeffrey Chernov and screenwriters/executive producers Roberto Orci & Alex Kurtzman (“TRANSFORMERS,” “MI: III”), comes a new vision of the greatest space adventure of all time, STAR TREK, featuring a young, new crew venturing boldly where no one has gone before. 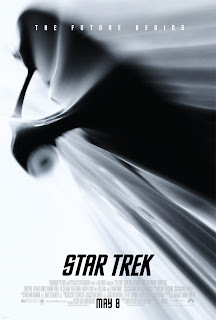 Paramount Pictures and Spyglass Entertainment Present a Bad Robot Production STAR TREK starring John Cho, Ben Cross, Bruce Greenwood, Simon Pegg, Chris Pine, Zachary Quinto, Winona Ryder, Zoë Saldana, Karl Urban, Anton Yelchin, Eric Bana and Leonard Nimoy, and based upon “Star Trek” created by Gene Roddenberry. The film’s director of photography is Dan Mindel, ASC; the production designer is Scott Chambliss; the film is edited by Maryann Brandon, A.C.E. and Mary Jo Markey, A.C.E. ; the costume designer is Michael Kaplan; the visual effects and animation are by Industrial Light & Magic; and the music is by Michael Giacchino. This film has not yet been rated. worldwide on Friday, May 8th. Star Trek is not a reboot?